Finally I’ve cracked the secret! And I seem to be the first one on the internet… Hooray! This has to be one of the best discoveries I’ve done so far. Once again, special thanks to OroJackson user @Genkei for his help on the buildings. The rest was found on my own. IF YOU ARE GOING TO USE THIS PLEASE CREDIT ME AND LINK TO THIS WEBSITE. THANKS. 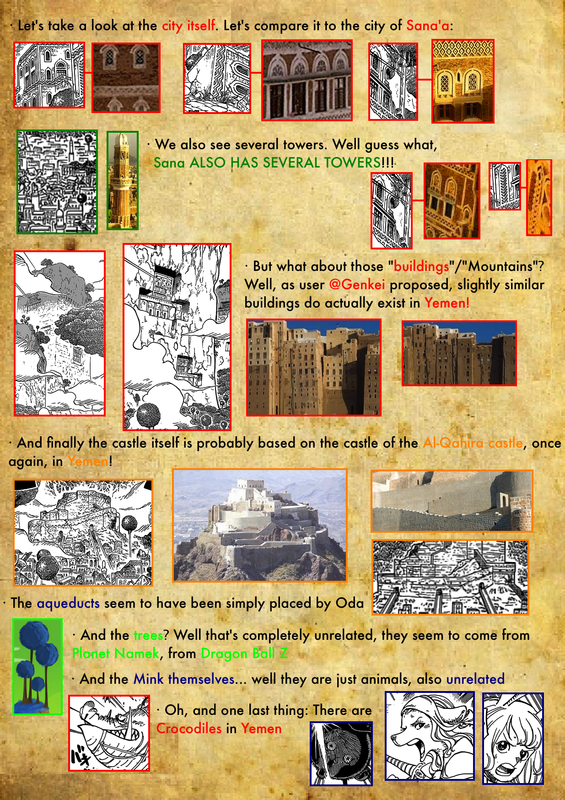 Nice find with Sana’a, but you should also check Naqsh e Rostam and Bam Citadel, in Iran. The last one is a better choice than Al-Qahira castle. I’m from Yemen , specifically Sana’a city! I was shocked when I read the manga when it was released cause I realized it at the time! It is as you said, you can add the big tree as well! Search for socatra island in Yemen you will understand. And by the way the water that is been covering the city everytime you can search for pictures of (old Sana’a city after rain) and you will see the resemblance. 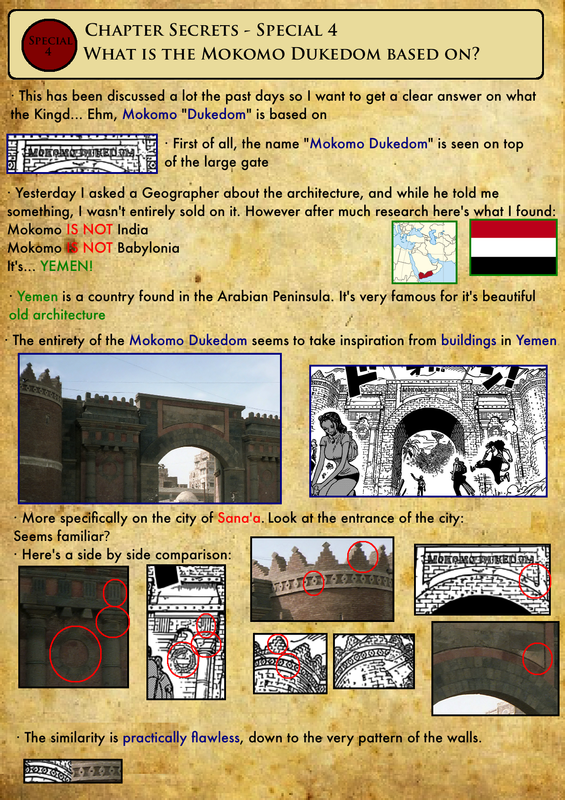 And one more thing old Sana’a city is in dead a historical place the pictures you used are of old Sana’a city gate which is called bab al Yemen! 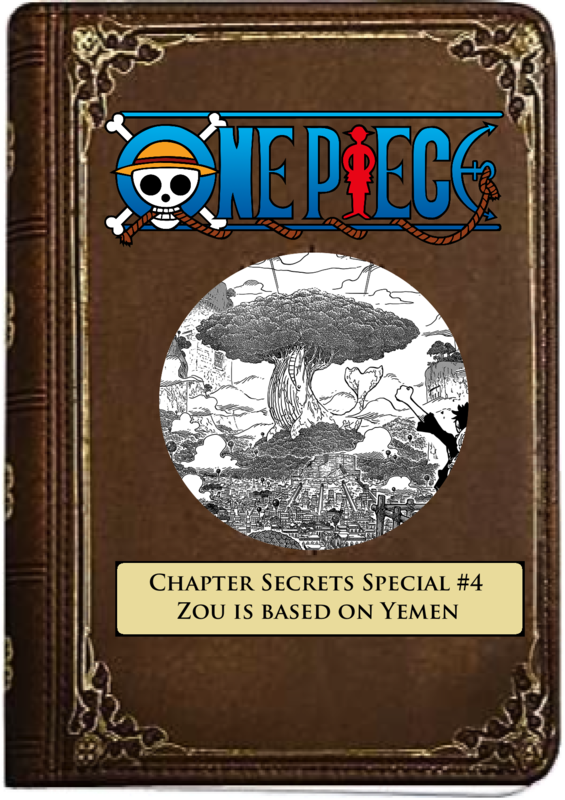 (I’m not sure if oda was watching the news at that time when he was inspired but I recall when I read the manga it’s true my country was at war and in fact we were divided in two major powers fighting one enemy) (one more thing the people in Yemen are allowed to carry weapons even children in other words the can all fight) you may check that on google! Anyway thanks for your work I have been reading your analysis for some time I just didn’t notice this one until today!